As part of anti-invasion preparations during World War II, many pillboxes were constructed on and around Portland; concrete guard posts which have embrasures for the firing of weapons. 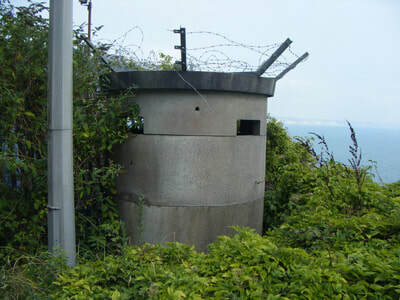 Across the UK, approximately 28,000 pillboxes and other similar defensive structures were built in 1940 as a response to the feared German invasion, code-named Operation Sea Lion. 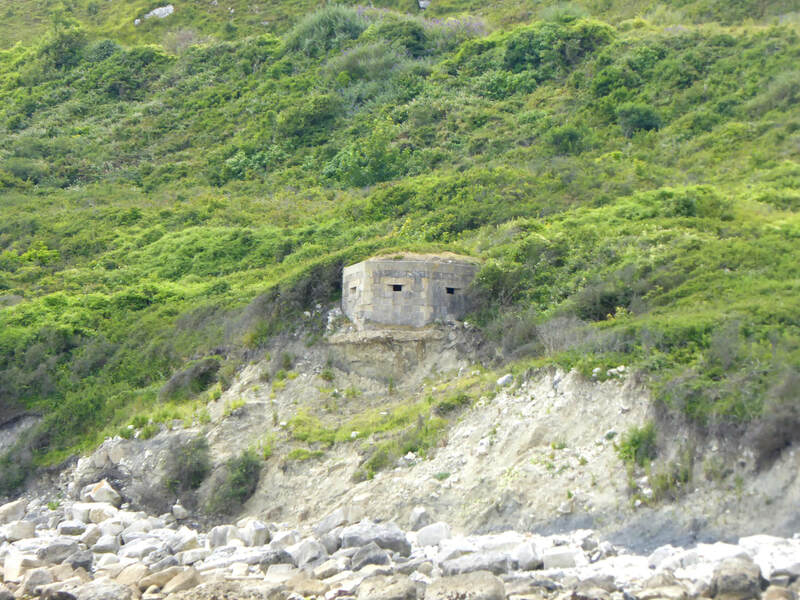 A number of these pillboxes still survive on the island, although many have been demolished. Some pillboxes of Cold War origin were later installed on Portland, largely at RNAS Portland. 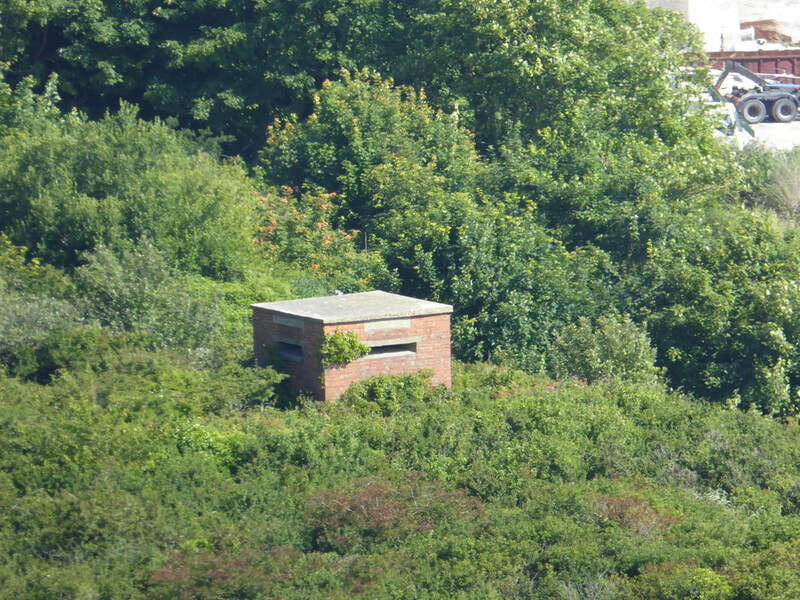 The list below includes approximate grid reference locations of all land-based pillboxes on Portland or overlooking it, but does not include those found on the breakwater arms of Portland Harbour. Hyperlinked pillboxes have their own pages with photographs and other details. 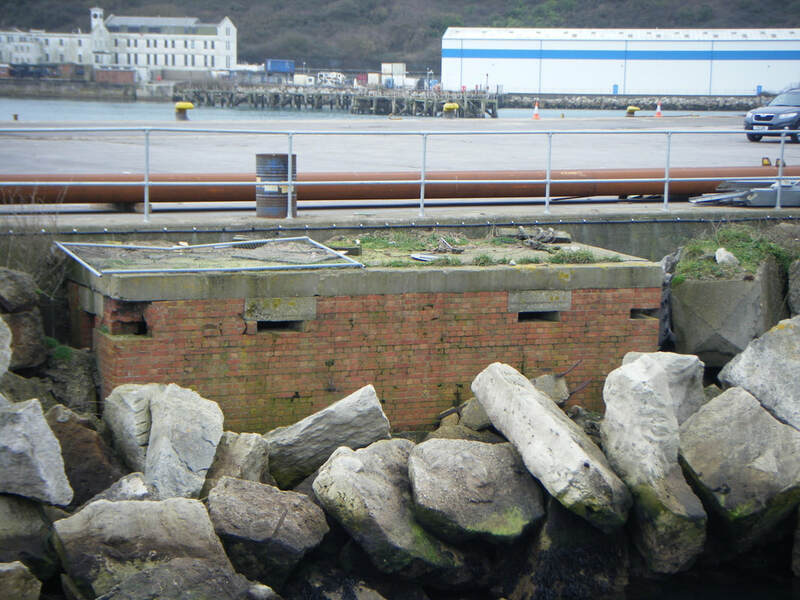 Pillbox at SY 69464 74694 (Coaling Pier) - located on the northern edge of the Coaling Pier within the former naval base, on private property. Pillbox at SY 69378 74666 (Coaling Pier #2) - located on the northern edge of the Coaling Pier within the former naval base, on private property. Pillbox at SY 70460 71621 (Durdle Pier) - built in the vicinity of Durdle Pier on the eastern side of the island, accessible to the public. Pillbox at SY 70359 71642 (Durdle Pier #2) - built in the vicinity of Durdle Pier on the eastern side of the island, accessible to the public. Pillbox at SY 69618 73917 (East Weare Batteries) - located at D Battery of the East Weare Batteries. Pillbox at SY 70478 72746 (Folly Pier) - located in the vicinity of Folly Pier on the eastern side of the island, accessible to the public. Pillbox at SY 70271 72634 (Rifle Range) - located in the vicinity of the East Weare Rifle Range, on private property. Pillbox at SY 70380 72628 (Rifle Range #2) - located in the vicinity of the East Weare Rifle Range, accessible to the public. Pillbox at SY 66588 75631 (Chesil Beach) - located at the southern end of the Fleet Lagoon and close to Ferry Bridge, on the hexagonal base and parts of the walls now survive. It is accessible to the public. 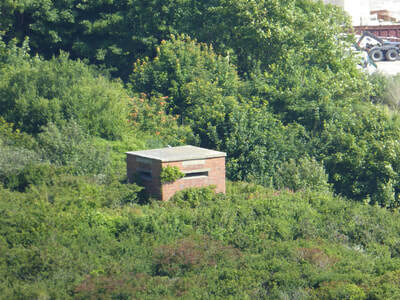 Pillbox at SY 66998 76614 (Wyke Regis) - located on the northern side of Portland Harbour, close to Ferry Bridge. Only the base and a scattering of bricks now remain; it is accessible to the public. Pillbox at SY 69719 71090 (Church Ope Cove) - built overlooking Church Ope Cove, it has since been demolished. Pillbox at SY 69828 71060 (Church Ope Cove) - built on the eastern side of Church Ope Cove, it has since been demolished. Pillbox at SY 69652 73530 (East Weare Batteries) - built in the vicinity of the East Weare Batteries and demolished by Portland Port Ltd in 2016. 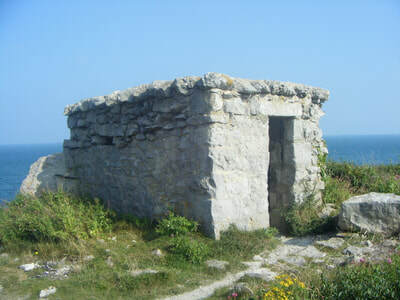 Pillbox at SY 68408 74382 (Portland Castle) - built west of Portland Castle and later demolished. Pillboxes at RNAS Portland - a number of Cold War "Yarnold Sanger" pillbox were located surrounding the perimeter of RNAS Portland. All were demolished in the late 1990s/early 2000s as part of the development work of Osprey Quay. Approximate locations: SY 68206 73914, SY 67912 74238, SY 67599 74602, SY 67550 74663, SY 67899 74303 and SY 68429 74291. Pillbox at SY 69924 73348 (Upper Osprey) - located at Upper Osprey and demolished in 2016-17 by Portland Port Ltd.
Pillbox at SY 69900 73151 (Upper Osprey #2) - a Cold War "Yarnold Sanger" pillbox located at the gates of Incline Road and demolished by Portland Port Ltd in 2016-17. Pillbox at SY 69750 73529 (East Weare Batteries) - built in the vicinity of East Weare Batteries, close to A Battery. A field visit recorded the pillbox survived in 1997, but its existence is now uncertain. Pillbox at SY 69868 73531 (East Weare Batteries #2) - a second pillbox close to A Battery, in existence in 1996 but now unknown. Pillbox at SY 69839 73660 (East Weare Batteries #3) - located east of B Battery, in existence in 1997 but now unknown. Pillbox at SY 69819 73918 (East Weare Batteries #4) - located east of C Battery, in existence in 1996 but now unknown. Pillbox at SY 69559 73890 (East Weare Batteries #5) - located near D Battery, only fragments were recorded in 1996. One of two pillboxes at Durdle Pier, notable for being constructed of Portland stone. Pillbox overlooking Folly Pier on the east side of the island. 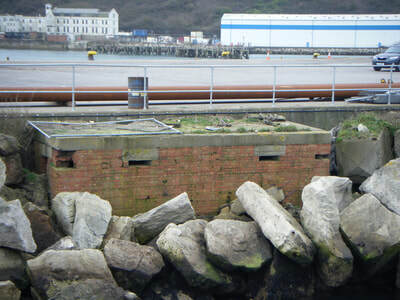 One of two pillboxes located on the Coaling Pier within the former naval base. One of a number of pillboxes to be built around East Weare Batteries. This example was demolished in 2016. A pillbox, now demolished, at Upper Osprey. 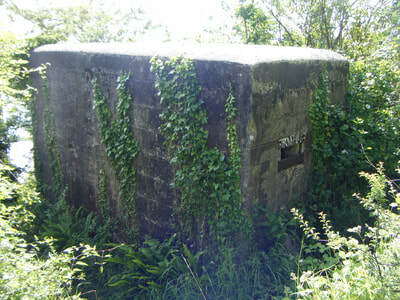 A Cold War "Yarnold Sanger" pillbox, now demolished, but an example of the various ones located around RNAS Portland.